Tinea Versicolor - YeastInfection.Org by Eric Bakker N.D.
A condition which is often confused with vitiligo or other common conditions which affect the pigmentation of the skin but which is actually caused by a yeast infection is, Tinea Versicolor. This is also often referred to as Pityriasis versicolor, Dermatomycosis furfuracea or Tinea flava. The reason for Tinea versicolor often being mistaken for vitiligo is because although the condition may start out as a group of small spots on the skin which are lighter than the surrounding area, if left untreated they eventually join up to make a discolored lesion. However Tinea versicolor can also appear as red spots rather than simply white and this can often help in achieving a diagnosis. Unlike vitiligo the lesions or spots associated with tinea versicolor can appear quite scaly in nature but this is usually at the margins which often assists with providing a definitive diagnosis. Yet for all it has similarities to vitiligo, tinea versicolor, which can often be accompanied by slight itching, is actually caused by a yeast which lives on the skin and is therefore treatable. 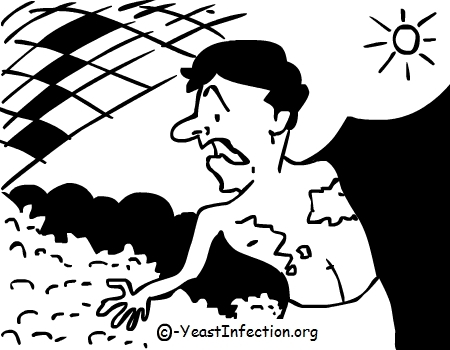 The yeast usually responsible for the problem is one known as Malessezia Furfur and although it is found on the skin in the majority of adults under certain conditions it will, like Candida albicans, multiply and start to cause problems. Vitiligo often presents on symmetrical sides of the body whereas tinea versicolor most usually does not. Tinea versicolor usually appears on parts of the body distinct from the areas where vitiligo is normally found. For example, vitiligo manifests more commonly around the armpits, eyes, fingers, groin, mouth and wrists, whereas tinea versicolor is usually found on the back, chest, stomach and upper-arms. Quite often tinea versicolor is itchy, although not distressingly so, whereas vitiligo infrequently produces skin irritation. Once you have achieved a diagnosis of tinea versicolor, which I recommend doing via a qualified professional, then there are two avenues of treatment. Many people commence treating it with conventional medications and those are usually in the form of antifungals. Ketoconazole is most popularly used with selenium sulphide being the primary ingredient in shampoos. Antifungal shampoos are often prescribed if the yeast overgrowth is on the scalp. This is applied and left on for a short duration, usually 5-10 minutes, before being rinsed off again. Often this has to be done every day for around a week to ensure the infection is fully treated. A downside to these products is that they don’t have the most pleasant of perfumes and some people find this quite difficult to deal with. Antifungal creams are the treatment of choice when it comes to clear areas of skin which are affected. These are applied once or twice a day usually for a minimum of two weeks. Antifungal tablets are usually only used if the areas affected are large and diverse or the patient has recurring tinea versicolor. Sometimes the tablets are used in conjunction with the cream or shampoos in such cases. Unfortunately, like other yeast infections, tinea versicolor is prone to returning and particularly if you experience the conditions which triggered it the first time round. Often patients are advised, even after the main course of treatment, to apply creams or use shampoo on a very much reduced or regular scale for some time into the future to prevent recurrent problems. The good news is that although it might take several weeks or months, the normal pigmentation of the skin does return. The other avenue of treatment is to look at natural remedies. This is my preferred avenue because there are no, or few, reactions and also it is more likely to resolve the condition permanently. Firstly you have to rid your skin of the yeast and I recommend doing this by applying Tea Tree Oil. Although there are a vast number of these oils on the market today the one I find to be the most successful is the Australian Tea Tree Oil (Melaleuca alternifolia). Apply one drop to an affected area and gently massage it in. The results from this oil are likely to be as spectacular as any you will see from conventional medications. It may well work with other kinds of Tea Tree Oil but it could also take longer. Another natural treatment you can try is Oregano Oil, however this product does seem to be more aggressive and I would suggest that you only use it, and very sparingly, if progress with the Tea Tree Oil is particularly slow or you have long standing damage. How Ginger Can Help against Candida? When you are looking to relieve the discomfort which can be caused by tinea versicolor I would recommend one of the many natural oils or treatments which are noted for soothing inflamed or damaged skin. These include Aloe vera (which is also a natural anti-inflammatory), Jojoba, natural organic beeswax, emu oil, goanna oil, or herbal calendula. When you purchase these products try to look for brands which are cold pressed and with no additives to ensure you are getting the best quality product available and also one which will not irritate the skin further. Often the better quality products have only a slight perfume which evaporates very quickly after use. These products are very good for moisturizing the skin while you are using Tea Tree to heal the damage. Using natural products means it takes a little longer than conventional medicines to produce a result because they are less aggressive. Normally you are looking at several months before seeing your skin return to normal. However you are much less likely to experience recurring infection even if you are exposed to the situation which triggered the problem the first time round. How was it discovered? Who or where can I find records on how it was found? Do you know if this can be passed on to others by touch? If so, for how long are you contagious? Can tinea versicolor cause permanent skin damage?